VANCOUVER, BC - We’ve been through this all before; a sense of hope, promise and a chance at qualifying for a World Cup for the first time since 1986. But there seems to be something different about it this time around. Despite being drawn into the group of death with Mexico, Honduras and El Salvador, Benito Floro’s men hold fate in their own hands. Picking up a 1-0 victory over the Hondurans is just the start. Now 32, Atiba Hutchinson’s career has taken off since his move to Turkish side Besiktas. He’s draw the praises of Arsenal’s Arsene Wenger during last year’s Champions League and has been a staple in the spine of the Besiktas lineup. 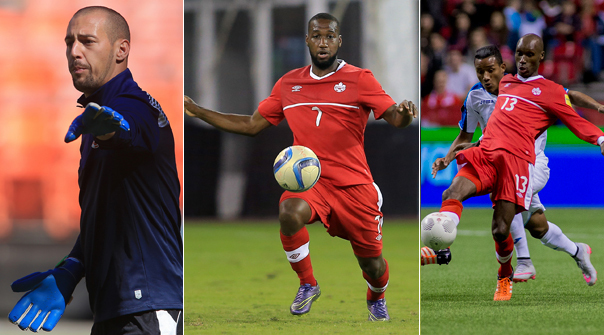 His technical ability and defensive work rate is the engine of Canada’s midfield. It showed in his man of the match performance on Friday night. He held the ball, distributed clinically, drew multiple fouls and dragged the game away from the Hondurans. 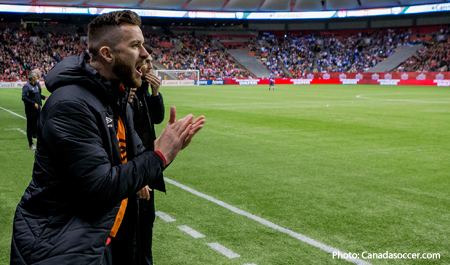 David Edgar now playing in League One with Sheffield United, on loan from Birmingham City – Edgar’s club career has seen some ups and downs, but what always remains is his commitment to Canada. He consistently shows up and leads by example, helping Canada’s backline to a fantastic defensive record of late – allowing only 2 goals this year in qualifying and the Gold Cup. Coming off an injury, Edgar didn’t feature in Vancouver but will take his spot when back to full fitness. Milan Borjan has taken over at Ludogorets Razgrad since moving back in July, which will be key to Canada’s qualifying hopes. 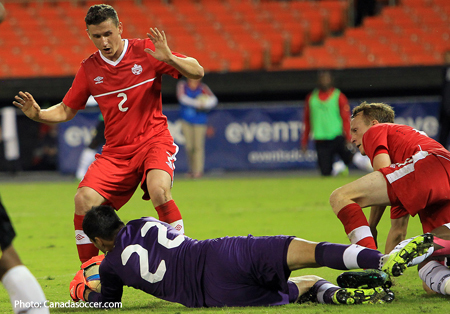 Milan is one of few Canadian keepers worldwide that are seeing consistent playing time. Simon Thomas is the other, playing for Strommen in Norway. Kenny Stamatopoulos has found himself in a backup role for AIK in Sweden. Coming back into the side against Ghana, Lucas Cavallini’s hiatus has been a long one. His last call up was at the mere age of 19 to San Pedro Sula in 2012. Now, 22, and has proven to be a consistent scorer in the Uruguayan Primera Division over the past few seasons with Fenix. Likely stuck behind Cyle Larin, he will provide critical depth at a premium position. Originally named part of Floro’s squad, Cavallini misses out on these fixtures through injury – being replaced by Crewe Alexandra’s Marcus Haber. The biggest difference maker for Les Rouges might just be the newest man to the program, Junior Hoilett. The speedy, winger has been a question mark to Canadian fans for many years – but with his allegiance clear now and the time has come to sit back and watch what he’s capable of. We definitely saw flashes of brilliance in his first taste of CONCACAF World Cup Qualifying, driving at defenders and creating chance after chance. But this is a long qualifying campaign and a few younger Canucks could come into prominence before all is said and done. Michael Petrasso is a player who will almost surely get a look before all is said and done. Behind a gluttony of wingers at QPR (including Junior Hoilett), the young Canuck has his work cut out for him in order to get first team minutes. If he’s got something going for him, Petrasso’s speed and technical ability are off the charts and his potential is sky high. Already called into the team, Fraser Aird’s journey to Vancouver can be called somewhat of a surprise on a number of levels. Aird, a Scottish-Canadian, is listed as a defender in the squad – something he has been working on with his under-21 club team, Rangers FC. The Glasgow side have moved the young Canuck back from a right-sided midfield position into a right-back role. One that Canada is particularly thin at, especially with the injury to Nik Ledgerwood. He will battle New York Red Bulls defender Karl Ouimette for minutes. But is there a wildcard to join the national team? Jamar Dixon is a name to be familiarized with. The 26-year old Ottawa native, who plies his trade with FF Jaro in Finland, is the definition of a utility player. He has played all over the field for his Finnish side and that flexibility could serve a purpose moving forward. One thing is for certain on this road. Expect the unexpected – this is CONCACAF, after all.